EDIT 31/12/18: I found the solution! It turns out that my laptop has Nvidia Optimus installed. As far as I know, only some laptops can turn this setting off. There are two ways to do so. No.1 is to go into your BIOS settings (usually F2 or DEL when starting up) and look for a setting that says something like "disable Nvidia Optimus". I don't have that setting sadly No2. This method is less successful but might help anyway. Go into Nvidia setting on your desktop and change preferred graphics processor to high-performance Nvidia processor in global settings. I still think I might invest in some type of HDMI repeater or maybe the Vive Breakout box as using these has worked for a post with a similar problem on nearly the same laptop, the post was brought to my attention by Richooal on the Oculus Support forums. Hope this helps anyone with the same or similar issue in the future. Thanks to Richooal on the Oculus Support forums, and everyone on the Oculus subreddit who helped with this. I purchased an Oculus Rift and Touch controllers set for Christmas a few days ago. I went through the installation but when I got to set up, the app wouldn't detect that my HDMI was plugged in. I was frustrated and went searching through forums to find a solution. I tried several different things. 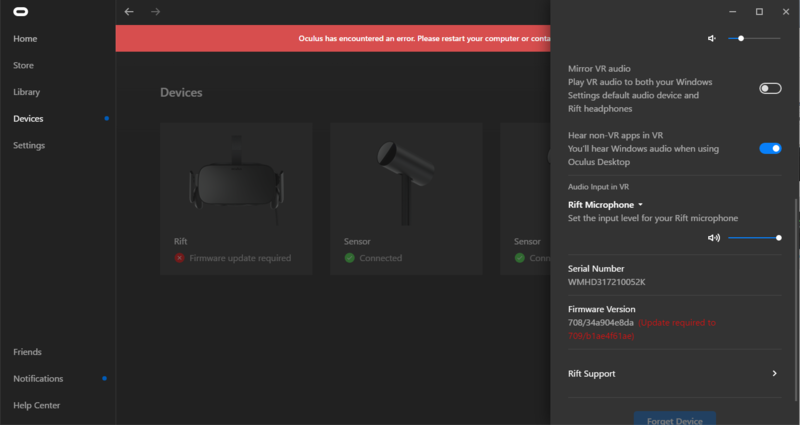 Reinstalling (I tried also deleting EVERYTHING related to Oculus and installing again), Repairing, Checking the connections on the Rift headset, updating drivers, and nothing worked!! I restarted my PC several times!! Inside the App, I also found that Oculus had "encountered an error"
I requested a support ticket and I got a very vague and unhelpful response, although Oliver did seem very nice. Waiting on a second response. Thanks Oliver! Now I do know that my graphics card is just SLIGHTLY ( I have a GTX 970M, minimum = 980M!) under the minimum recommendations but countless others have gotten the Rift to work on less. I dont see why having an underpowered graphics card affects the APP of all things. The main issue though it the firmware update 708/34a904e8da which I can't find online or on the app. There is nowhere to update it or no place to find a reason for it not being updated already. I have scoured the internet and have found no way to manually update the firmware, besides going into the library and looking under updates. It's not there either. 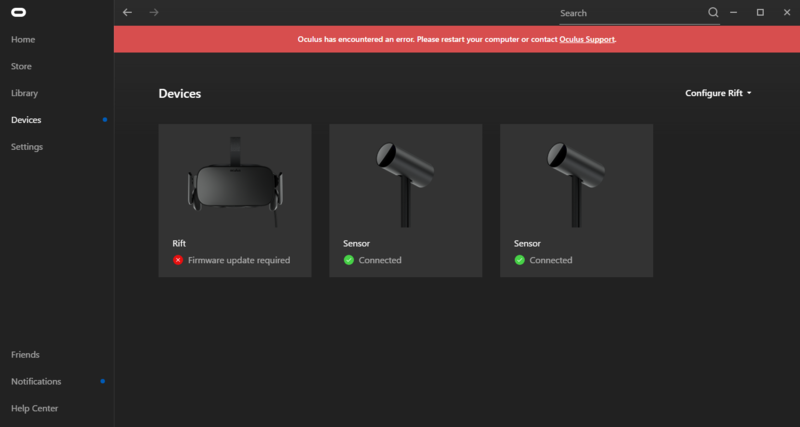 So I ask you Oculus staff, how and where do I update it!! I would really like to use your product since I have already paid €400 for this. It should just work. That is all I have to say, I would really appreciate a response soon. Thanks for the response Richooal. I am using a Gigabyte P55 laptop, I can open it up and have a look inside but how would I know if it is or not? Sorry, can't help with that. But I should add that "Optimus" laptops are also a problem with the Rift. Excuse the long copy/paste below, but this post by @hotbabe13fcali details efforts to get a Gigabyte P55 with GTX1060 to work. The following is what I posted to Reddit a week or so ago. I'm going to figure out what the hell my problem is. I just won a bid for a vive breakout box for $40 (with power adapter) on eBay and it should arrive here in the next few days. My black screen issue is probably different than most on here as I'm using a laptop. 1/26 - the vive breakout box fixed my issue. I'm dumb and bought a rift without realizing my laptop has Optimus (of sorts) and uses the default Intel graphics chip and their is no way to change or trick it. As a result, I get only a black screen when the HMD is active. Tracking works. Does anyone else own a Gigabyte laptop and have had a similar experience? -Downgrading all drivers so they match what the recent Gigabyte 'Smart Update' states. Using the sensors plugged into a verified powered USB hub from Amazon. The HMD is plugged directly into the laptop. I had a vive for about 8 months last year and it was fantastic but I unfortunately had to part ways with it due to unforeseen financial circumstances. For the last four hours I've been trying to figure out this issue and I just have a hard time believing it's due to Optimus. I own a Gigabyte P55Wv6 laptop. It's been fantastic to me overall. 1060, i7-6700hq, it even stated on Newegg it was 'vr ready' and gigabytes site states its 'vr recommended'. Maybe for the vive, but I unfortunately didn't get the opportunity to test it on this laptop when I owned a vive, but something is telling me it would work fine. For those who don't know, Optimus is basically when your laptop has two graphics cards, the first one being an Intel Integrated and the second one being your nvidia gpu. From everything I've looked up it sounds like the rift is only detecting the Intel graphics even though the compatibility test passed. Like many, the sound works, but I'm not getting a picture, just a black screen. When I started researching I just slowly got more and more depressed. I worked months to fit this into my budget and wanted it to work but I'm questioning if it's even worth attempting to solve. I went into my BIOS and the only setting I have is 3D accelerated graphics. When turned off, only the Intel graphics will show up in device manager. I wondered if it was the Nvidia driver not working right so I went ahead and did a clean install of the driver with no avail. I do not have any kind of remote desktop client or overlay on either. I attempted to use a type c adapter for the USB, disabled my laptop monitor and used the vga port and attempted to disable the Intel graphics and still nothing. Part of me says I can still do a few things, I can try to plug the rift into another pc to eliminate if it's just dead, I could wipe my laptop and start fresh, or find a friend with a vive to test on the laptop to confirm it will even work. I might even be able to try and attempt a HDMI to VGA adapter. But the other part of me says what's the point. It's most likely not going to work due to my own damn setup and not researching enough before my purchase. 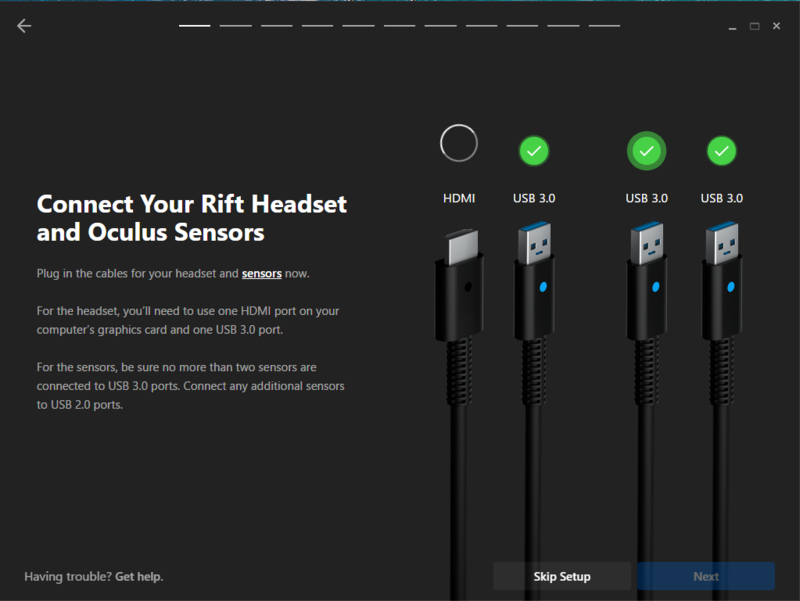 After all, Oculus does mention something about "laptops not officially supported". Failed to mention in original post; I attempted to force the Nvidia driver to be the primary with no luck. I ordered an HDMI repeater (female to female) going to see if I can trick it. If that doesn't work I'll attempt to downgrade my driver's again to see if that might be it (doubt it) and a last ditch effort I'm going to purchase the pricey vive breakout box as a few posts on the oculus support site show that may work too. Repeater didn't work. Bought a type c adapter to HDMI knowing it didnt have the ability to transmit hdmi. Downgrading graphics drive didn't work. I originally got this rift second hand so im not eligible for warranty, I went to Best Buy and bought a rift new just to see if it was the rift. Surprise...it wasn't. Next update won't be for about a week or two. Going to see if I can get a breakout box on the cheap instead of spending $30 on the box and $40 on the cables (lol wtf vive). If I can't I'll cough up the $70 for it just to see if this works. If all else fails I'll probably just end up selling the rift and trying to get a vive instead. Or just waiting for whatever the hell new comes out this year. I'm sorry for the delay but I'm not sorry, it gave me time to test it for a few weeks. I can confirm in my specific situation the vibe breakout box worked flawlessly and has been working for a few weeks now. I'm about to get a third sensor once they're in stock. On some laptops the HDMI connector doesn't connect directly to the video card, but instead connects to the integrated graphics. If yours does that, you are completely out of luck. The HDMI MUST connect directly to the GTX970M. Thanks again so much Richooal. This looks really promising and is almost identical to my situation, I cant tell how much this will help!! Im looking into a Vive breakout box and seeing if it will actually help or not.